Mid Century Modern Nightstand with door. Through dovetails and brass knife hinge detail. Equally at home beside the bed or in the living room as an end table, this small case is constructed entirely of hardwood and designed to withstand a lifetime of use. The case is made from one board American walnut. The grain of the wood wraps around the nightstand. The sides, top and bottom are joined together with a through mitered dovetail. 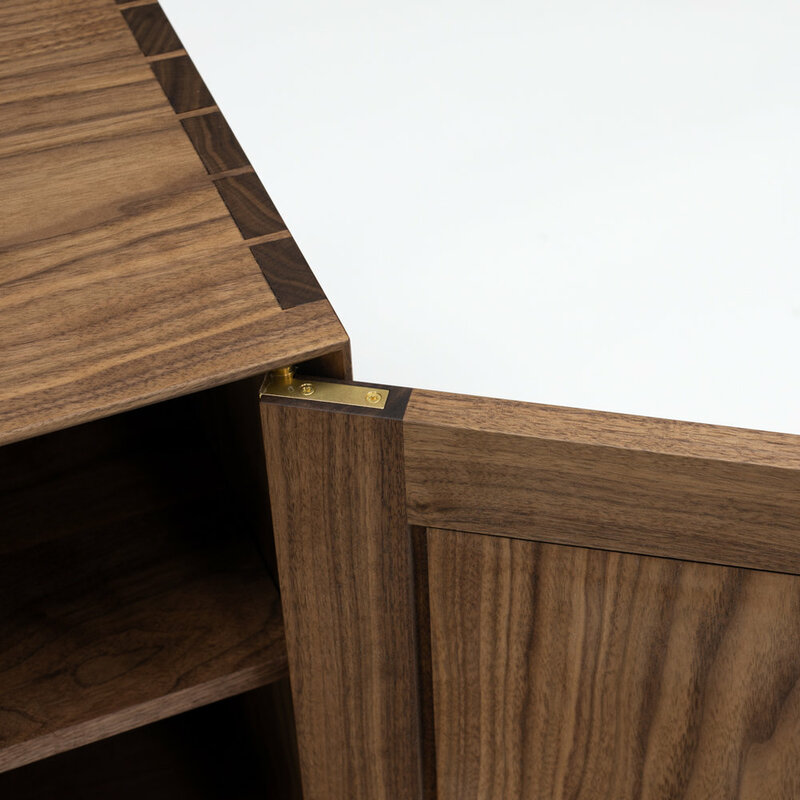 The back of the nightstand features frame and panel joinery. 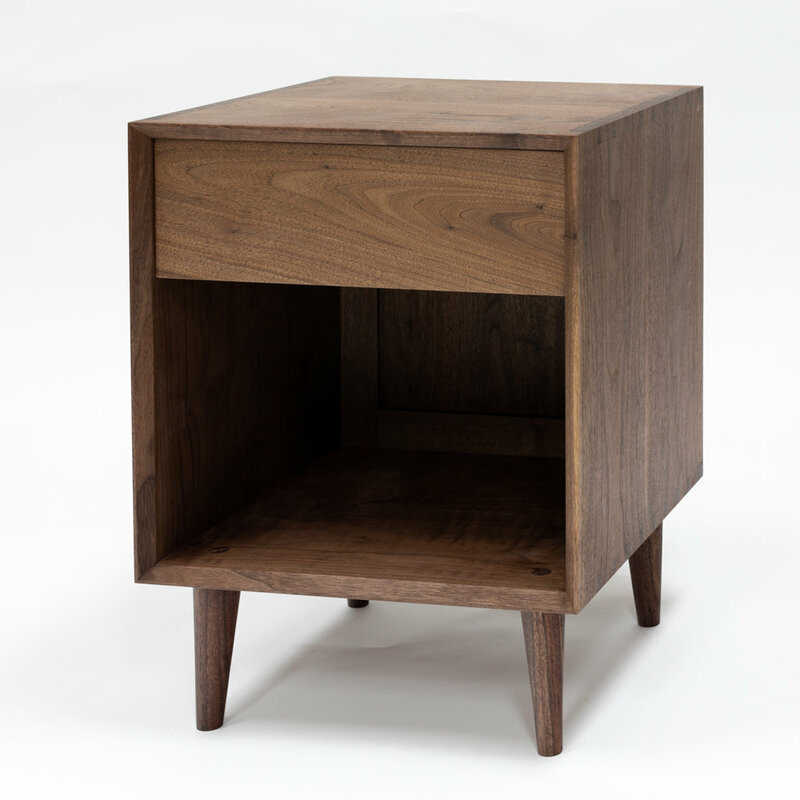 The case sits atop turned walnut legs which are joined to the nightstand with wedged mortise and tenon joints. One of the nightstands has a door that conceals an adjustable shelf. The door is hung with brass knife hinges and has a turned blackwood knob. The other nightstand has a dovetailed drawer. The drawer is piston fit into the opening. The drawer sides, back, and bottom are made from maple to contrast with the walnut. Finished with hand rubbed oil. Price guide: $2,100.00 for either the drawer or door version. 10% discount for a pair. Mid Century Modern Nightstand with drawer.